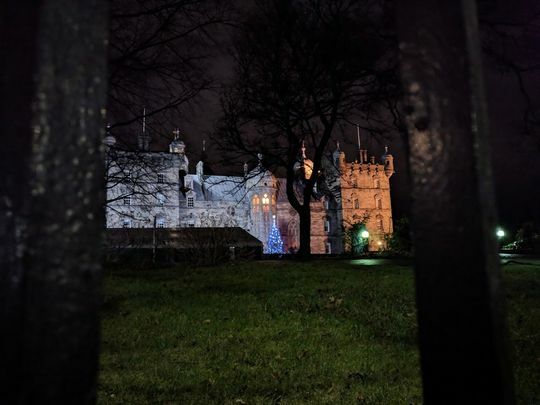 Is George Heriot's school Harry Potter's Hogwarts? 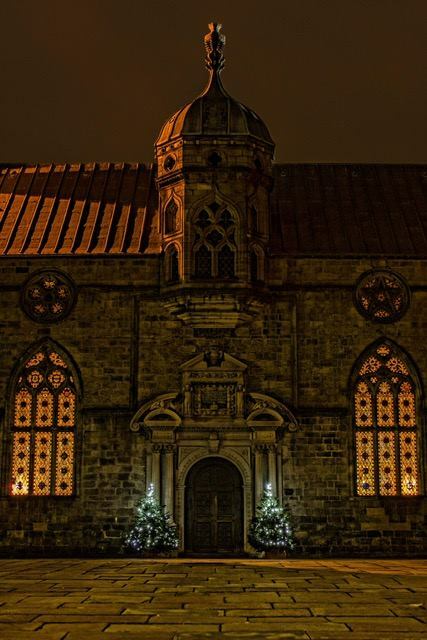 George Heriots is an impressive Romanesque building, set amidst grass grounds divided by a gravel drive, guarded by a gatehouse, smashed into the middle of urban central Edinburgh. The school looks down upon the shops and restaurants of the Grassmarket in the valley below and stares across at castle rock, soldiers check their watches by it’s tower clock. George Heriots throbs with 1600 tartan-clad children enjoying the finest education in Scotland and overflows with history. Slipping and stumbling, they followed Hagrid down what seemed to be a steep, narrow path […] There was a loud ‘Oooooh!’. George was a first class goldsmith, he provided jewellery to King James the 6th and his wife Queen Anne of Denmark. So trusted and loyal was he, that he was awarded an apartment beside the King in Holyrood palace. 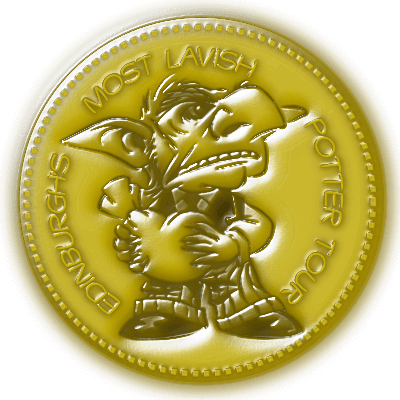 He was known locally as the Jingling Geordie, because his deep pockets rang with gold coins. 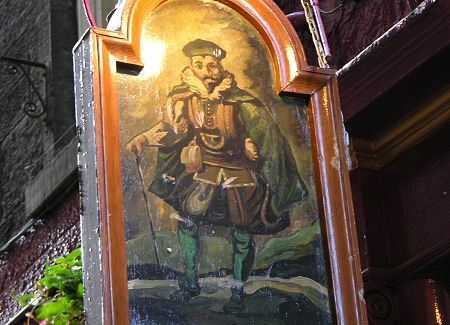 When King James the 6th moved down to London in a quiet Scottish takeover George accompanied the Royal Court. If the new Scot’s Londoners expected special favours from their King, they got none. Wisely James doled out land, honours and jobs even handedly amongst the English and Scots. English Catholics in London had hoped the new Scottish King would overturn his Protestant predecessors crack-down on their religion. James, a foreigner, was careful not to upset people by overturning the existing order. The Catholics grew disappointed and set about blowing him up. When Guy Fawkes was caught lighting the fuse on 36 barrels of gunpowder beneath Parliament’s Westminster palace, he confessed he wanted to “blow the beggarly Scots back to their mountains”. During interrogation Guys Fawkes expressed regret at having failed and King James praised his unwavering manner as possessing “a Roman resolution”. Fawkes was then hung and his body chopped into quarters which were sent to “the four corners of the Kingdom” as a warning. 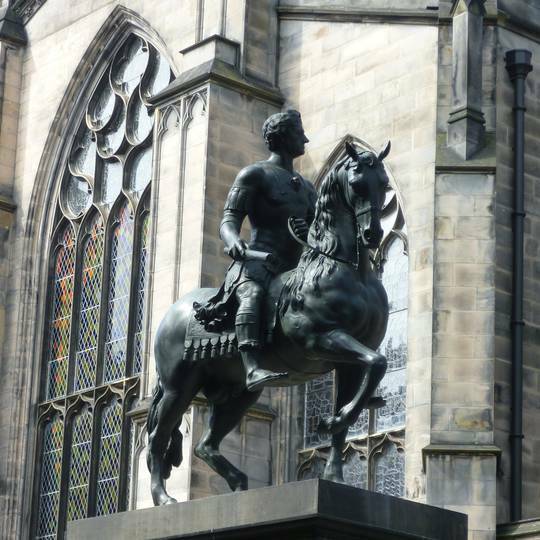 Edinburgh would have welcomed our King soaring home, we were missing him. 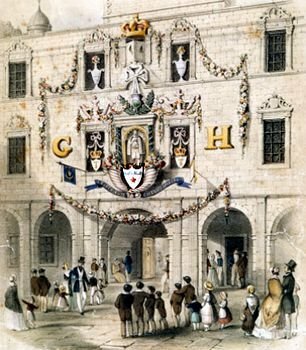 The King, Jingling Geordie and the Royal Court had added colour, importance and liveliness to the capital, and there was a torpid trickle down of money. Now all we had was rain, mud, poverty and ale. King James’ Scottish circle drew closer and George Heriot effectively became a banker to Royalty. He would secure loans to the King on the jewellery he’d sold Queen Anne himself. The debts became so huge, George didn't hope for them to be repaid and just lived off the interest. George Heriot had four children by his first wife, all of them died, his 2 sons dying at sea. His second marriage was childless, and he died with no recognised heirs. George was trusted and lived a life of work, security and relative luxury, but he was well aware of the hard lives of his extended family. He left money in his will for 2 illegitimate children and his nieces, nephews and half brothers and sisters. The majority of his fortune, worth tens of millions today, he left to help families similar to his own, the children of deceased tradesmen facing hardship. His legacy established a hospital or school for the free education of poor and fatherless ‘bairns’. The motto of George Heriots school is "Impendo" which translates as "I Distribute Cheerfully". 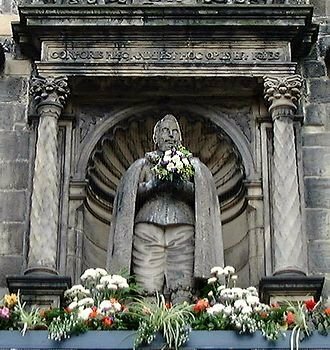 In the Quadrangle at the center of the school above a passageway toward the Castle, the school’s founder George Heriot has a statue in a niche on the North Tower. It was carved by the King’s master mason Robert Mylne and bears a latin inscription which translates to “This statue shows my body, this building shows my soul”. And what a magnificent building it is. Hogwarts is a very real place to me... I've always imagined it to be in Scotland... which... it was never made explicit in the books but the British reader will know that because if you do travel for a day from King's Cross Station in London and you go north, you end up in Scotland. So it was always supposed to be here. Since the 1880s the school began charging fees, becoming “for the rich. And fatherless bairns”. Towards 10% of the intake each year are ‘Foundationers’. Promising students who’ve lost either a mother or father are admitted for free, in the hope the nurturing environment will turn their fortunes around and the school will tell you this the core of what they do. This tithe to the less fortunate is secured in new housing developments in Edinburgh, the council mandates property developers place aside 10% of their stock as affordable housing. In 1979 the School began admitting girls, they had to, they needed the money. Cameron Wyllie - there are few teachers whose first name is so well known, even though you'd never use it to address him. A huge character of a man, his lessons were some of the most entertaining hours of my school life, and I despise English! He caught me skipping school for a Subway sandwich. Grrr. 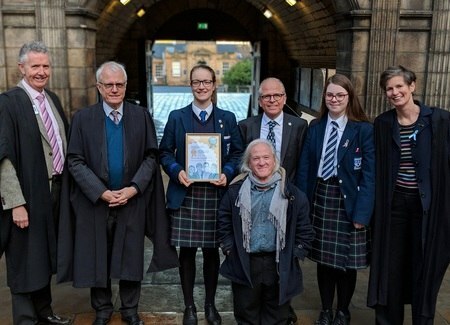 The School now costs £11,600 a year, the present headmaster Cameron Wyllie having maintained George Heriot’s traditions of care and achievement and cracking down on Subway-truancy. Both the boy who lived and Tom Riddle lost parents, well losing a parent wasn’t enough for Tom, he had to murder the other one too. If they grew up in Edinburgh they too might have been inducted into George Heriots School for the poor and fatherless children. Although it’s more likely Tom would have passed selection as a star brimming with potential. Harry begins with more character than work ethic I think. Lauriston after the new Road to the South, it bordered the city’s leafy Meadows so is Slytherin green. Greyfriars, after Greyfriars Kirk to the East, pure and white, like the stripes on a Hufflepuff badger. Raeburn is red like Gryffindor, named after a famous former pupil Sir Henry Raeburn who was an acclaimed portrait painter. Castle, blue like Ravenclaw, after the Saltire cross Scotland’s flag, which flies from Edinburgh Castle to the North. 4 towers, 4 competing houses, a school nurturing orphans… huh. The foundation stone of the school was laid in 1628, it took 31 years to complete, work being suspended through Oliver Cromwell’s conquest of Scotland. It employed so many and took such a long time it became known locally as ‘The Work’. It’s renaissance architecture, born of the time when we believed that the Greeks and Romans defined civilisation so we copied them. Together with Old College, the Galleries and the Parthenon on Calton Hill they form the jewels of neo-classical Edinburgh, and won us the slogan ‘the Athens of the North’. Something we still define Edinburgh by today and the city council is periodically lambasted by beloved author Alexander Mccall Smith as steering the city to become ‘Dubai of the North’. Councillors here have hard hard lives. It was the first building to be built outside the city walls, the Telfer city wall actually serves as the wall for the school grounds. To enter the school children and teachers would climb up from the valley of the Grassmarket to the grand tower, through a tunnel into the 4 walled quadrangle at its center. This was designed to inspire awe amongst new intakes. Tenements along the Northern edge of the grounds have now risen higher and the best view for the original face are now from the Castle Esplanade, or the charming vista from the West end of Victoria Terrace, the tall tenements of Victoria Street drawing your eye towards the school upon the ridge opposite. In 1649 Oliver Cromwell beheaded Charles the 1st, the King ruling Britain down in London who was of the Scottish Stuart line. Scotland rejected Cromwell as their ‘Lord Protector’, choosing the King’s son, Charles the 2nd as our King. Cromwell was apoplectic. In 1650 he marched up here and laid siege to Edinburgh castle. 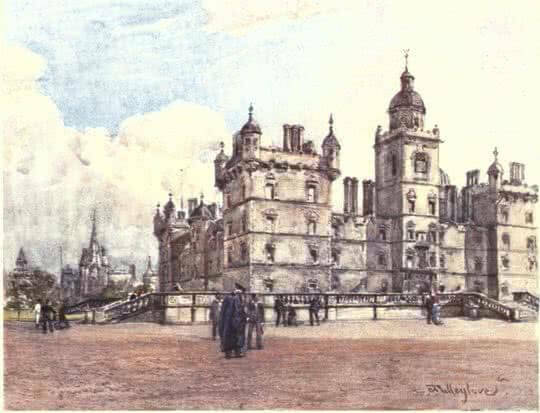 His cannons were parked up in the grounds of George Heriots, pounding the Castle daily, the half finished school became his head quarters, and the defiant Scottish parliament were in hiding, their grand hammer-beamed ceilinged Parliament Hall became Cromwell’s stables. Edinburgh didn’t take kindly to this, English soldiers on the Royal Mile frequently found themselves drenched in bucketfuls of sewage tipped from tenement windows high above. Cromwell passed an ordinance commanding that the sewage only be thrown out after 10pm at night, and passersby given fair warning. ‘Gardee Loo!’, essentially watch out for the poo, but it all sounds a bit nicer in French doesn’t it? After 3 months, with food still piled high in the larder, the Castle governor, Colonel Walter Dundas, wanted to change sides. As the loyalists met with Cromwell to agree their surrender the Scottish crown jewels were smuggled out. Cromwell had risen from a small-holding farmer and desperately wanted all the signals of a legitimate ruler, so his army was drawn out from George Heriots as they chased the jewels all over Scotland. They never got them. Work eventually resumed on fitting out the school. After Cromwell died, Scotland’s chosen ruler Charles Stuart II was crowned King of Britain. The Lord Protector’s body was dug up, hung in chains and beheaded. Legend has it Edinburgh did the same to the statue of him that used to stand outside Parliament House Hall. Oliver Cromwell’s statue was pulled down from it’s plinth, a local builder took it away, bashed Cromwell’s head off, buried it beneath Stockbridge, and melted a head of Charles II back on. Selling Franken-Charles back to the city for Charles II’s birthday. Who's your head feeling mate? Need an aspirin? 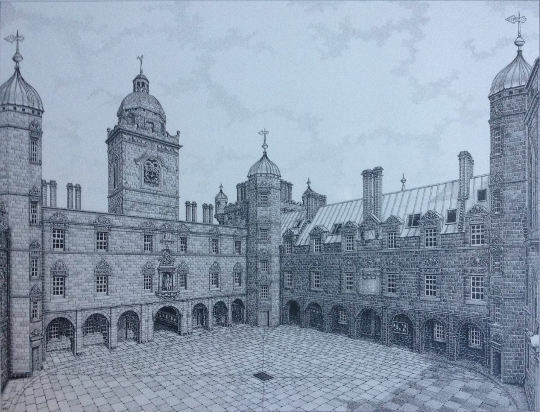 In 1659 George Heriot’s ‘hospital’ was finally completed and 30 sickly children were admitted. Heriot’s cared for both the children’s health and education. We christened it "a pauper’s palace". Entrance to the school was via a slippery climb up from the Grassmarket. In the 1830s the city was growing and a flat drive to accommodate carriages from Lauriston Place became more sensible. A new gatehouse entrance was built with a gravel drive leading up to the school, but the approach didn’t show the building at it’s best. The school’s rear walls were made of weather proofed rubble, so the rear 3 sides of the school were refaced in Edinburgh Craigleith stone. Is through the school gates with the West of Greyfriars Kirkyard, beyond the cemetery’s Flodden Wall arch. This is arguably the least attractive view, but you can take the building in whilst visiting some of the famous Harry Potter characters graves nearby. If it’s not School playtime, get the Castle in a shot to immortalise the geography. Many visitors are drawn to take a dynamic photo of the children’s playtime, they look charming in their fetching Tartan uniforms. Unfortunately a caretaker is posted to prevent this. It’s against the law in Scotland to take photos of children, so please angle your camera away from them and be kind to Mr Filch, the Sorting Hat rejected him. You can hire George Heriots to get married, they have a chapel. You could even hire it for a christening, and baptise your daughter a witch in ‘the real Hogwarts’. But if you don’t fancy that, well there’s still hope. They often provide tours once a year to the public on Doors open day towards the end of September. During August it’s often used to host the BBC who erect tents in the grounds, and you can purchase tickets to see their Edinburgh festival highlight shows. Find BBC shows on edfringe.com. The school gets the highest Higher exam results in Scotland and they will occasionally host a tour for teachers and others engaged in youth development. A request along the lines of “I’m fascinated by the Hogwarts connection, and how you nurture Hermione-level dedication”, perhaps. Or just down a vial of Felix Felicis and give it a go. A friend asked me if I remembered when we first saw Hogwarts. I had no idea what she was talking about until she said, ‘the day we went to Kew Gardens and saw those lilies called Hogwarts’. I’d seen them seven years before and they’d bubbled around in my memory. When Hogwarts occurred to me as a name for the school, I had no idea where it had come from. A retired RBS bank manager recently gifted three million in his will for the continuation of bursaries to parentless children and in 2017, 3 parentally challenged Syrian children were admitted as Foundationers. They didn’t know a word of English and were given iPads to help with translation. For more read Sandy Thin's uplifting story in the New Statesman. Every June the 5th Foundationers Day is celebrated, the school’s popular pipe band, prestigious ex-pupils, governors and all the Foundationers celebrate the school’s beginning. Which brings to mind George Heriot’s birth. Afterwards the school Governors and accomplished alumni have a ‘bun-fight’ (tea party) and sup wine from the long silver ‘loving cup’ made by George Heriot himself. JK Rowling's children went here. Helga Hufflepuff's cup? “Nitwit, Blubber, Oddment, Tweak”, as the greatest wizard of his age would say. JK Rowling knew Harry was going to be sent to a school for wizards before she arrived here. Harry's adventure, the first book, was born in Edinburgh but Hogwarts itself is fantastical, it has moving staircases, talking gargoyles, a ghost dedicated to mayhem and is sustained by slavery. It’s 90% imagination and stunning. However JK Rowling was on benefits for 18 months and would push Jessica around the streets of Edinburgh’s old town. She visited the adjacent Greyfriars Kirkyard cemetery, even being inspired to examine their register of interments, and latterly she frequented the nearby Elephant House cafe. So she would have also discovered the school. Rowling is drawn to beautiful old places, and as much as anywhere, George Heriots with its four houses, may have pollinated her imagination. Book a Harry Potter tour for the complete experience. Check out 4 more Hogwarts candidates including an ancient Castle & a school as unrestrainedly gothic as Rowling’s imagination. Yes Hogwarts has a spare. Hamish Coghill for many wonderful old town history classes. George Heriot's school website & Facebook. The New Stateman for the Syrian Foundationer story. Brian R W Lockhart, legend.